Visa management just called out this region for its "many opportunities" ahead. 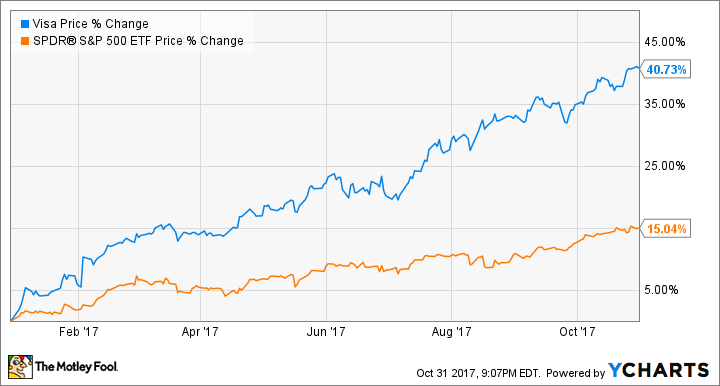 In what has surely become a familiar story for shareholders, Visa Inc (NYSE:V) once again reported a stellar quarter late last month. Looking over the company's numbers from its fiscal fourth-quarter earnings release shows one result after another for which Visa delivered powerful numbers. Net operating revenues rose to $4.9 billion, a 14% increase year over year. Payment volume across Visa's vast network rose to $1.93 trillion, a 10% increase year over year, driven by a 13% increase in processed transactions. Plenty of this fell to the bottom line, where Visa showed a 14% increase in diluted EPS to $0.90. The solid results pushed Visa's stock price higher, and it's now up more than 40% year to date, more than doubling the S&P 500's returns this calendar year. While there are several factors currently fueling the company's performance, after going through the conference call transcript provided by S&P Global Market Intelligence, it's clear that Visa's seamless integration with Visa Europe is playing a huge role in its success. Let's take a closer look at the results Visa is seeing in Europe that has so many investors bullish on the company's future. Visa has done lots of things right while integrating Visa Europe. This past summer, Visa extended its partnership with PayPal Holdings Inc (NASDAQ:PYPL) to include all of Europe. The deal, which comes at little cost to Visa, allows joint account holders to fund their bank accounts with their PayPal accounts over Visa's network and enables Visa Checkout at all of PayPal's Braintree merchants. It also allows PayPal to issue its own debit card in Europe. Visa Inc delivered a great quarter for shareholders on the back of its seamless integration with Visa Europe. Image source: Getty Images. Visa was also successful in renewing contracts with 75% of its financial institution partners in Europe, moving them from a rebate model to an incentive model, similar to the deals Visa has with its domestic partners. While this is a bit in the weeds, what's important to understand is that Visa Europe previously offered different incentive models to its financial institution clients to drive payment volume growth, brand awareness, and product acceptance. Visa is currently moving the "European model" of incentives to one more resembling the incentives it offers elsewhere. Management stated its European clients were "eager" to integrate its global solutions to Europe, something that can only be done through upgrading data centers and migrating the European network systems onto the company's global authorization clearing and settlement systems. On this front, CEO Al Kelly stated Visa was "on or slightly ahead of schedule" and that the technology migration remained a top priority for the company. The end goal remains "a smooth transition for our European clients to a global technology platform that will open up a wider set of solutions and products." Data source: Visa Inc 2017 Fiscal Q4 Earnings Presentation. Lower costs, greater earnings, and "a real catalyst for growth"
Europe contributed with mid-single-digit EPS accretion. At the end of the first year post-acquisition, Visa Europe is well ahead of our revenue projection, below our cost projection, with a lower effective tax rate. If we achieve the goals we have for Europe in fiscal year 2018, cumulative EPS accretion will be in the high single digits, and operating margins will be at or [above] Visa Inc. margins. We're poised to deliver another year of the robust revenue and earnings growth you have come to expect from Visa. In other words, Visa Europe is contributing more to the bottom line and costing less than expected. Visa is a large-cap stock with a fast-growing dividend. It's not only aware of potential threats from fintech upstarts but proactively seeking out partnerships with them, and it's capitalizing on opportunities around the globe. But investors should not miss the forest for the trees. Visa Europe's seamless integration into Visa's corporate fold has driven the stock higher to a greater extent than any other factor this past year, and that's something shareholders should get excited about going forward.